Biological photoreceptors use light either as a source of energy to drive metabolic processes (e.g., photosynthesis) or as a source of information for triggering physiological responses. Prominent examples for these latter sensory photoreceptors are phytochromes which are in the center of this project. The chromophoric unit of phytochromes is an open-chain tetrapyrrole that upon light absorption undergoes a photoisomerization around a methine double bond, followed by a series of thermal relaxation processes including proton translocations that eventually lead to a secondary structure change of the protein. In this way, phytochrome is reversibly converted between the physiologically active and inactive states that initiate or block downstream signaling cascades. The project aims at a comprehensive understanding of the molecular basis of these processes in bacterial and plant phytochromes. Here we use an integral approach by combining static (cryogenic) and time-resolved vibrational spectroscopies established in our group with crystallographic and theoretical methods as well as further spectroscopic techniques in collaboration. Further studies within this project are directed to the RR spectroscopic analysis of the photoinduced processes in retinal proteins that, similar to bacterial phytochromes, function as phototriggered kinases or act as light-gated ion channels. Velazquez Escobar, F., Lang, C., Takiden, A., Schneider, C., Balke, J., Hughes, J., Alexiev, U., Hildebrandt, P., Mroginski, M. A. 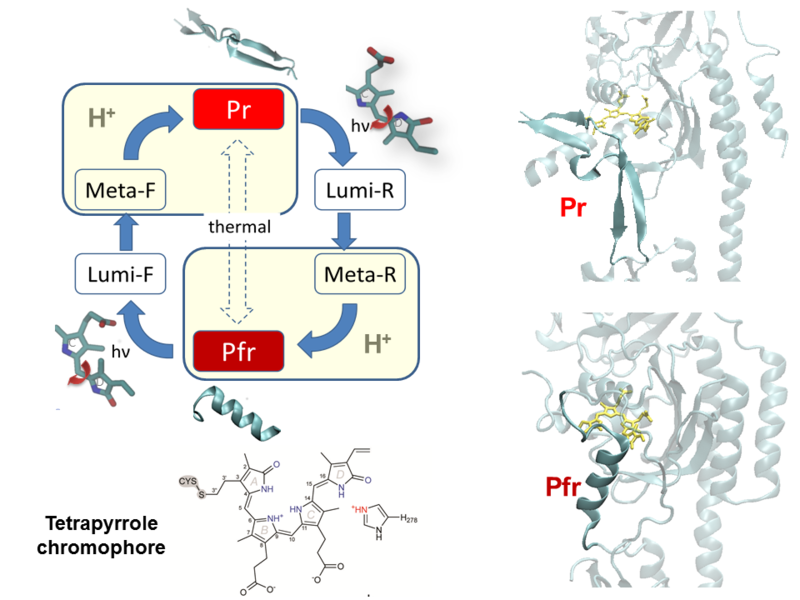 (2017) Protonation-dependent structural heterogeneity in the chromophore binding site of cyanobacterial phytochrome Cph12, J. Phys. Chem. B 121, 47–57. Buhrke, D., Velazquez Escobar, F., Sauthof, L., Wilkening, S., Herder, N., Tavraz, N., Willoleit, M., Keidel, A., Utesch, T., Mroginski, M. A., Schmitt, F. J., Hildebrandt, P. Friedrich, T. (2016) The role of local and remote amino acid substitutions for optimizing fluorescence in bacteriophytochromes: A case study on iRFP., Sci. Rep. 6:28444. Otero, L. H., Klinke, S., Rinaldi, J., Velázquez Escobar, F., Mroginski, M. A., Fernández López, M., Malamud, F., Vojnov, A. A., Hildebrandt, P., Goldbaum, F. A., Bonomi, H. R. (2016). Structure of the Full-Length Bacteriophytochrome from the Plant Pathogen Xanthomonas campestris Provides Clues to its Long-Range Signaling Mechanism. J. Mol. Biol. 428, 3702-3720. Song, C., Velazquez Escobar, F., Xu, X.-L., Narikawa, R., Ikeuchi, M., Siebert, F., Gärtner, W., Hildebrandt, P., Matysik, J. (2015) A cyanobacteriochrome sustains its color despite a change of the chromophore´s protonation state, Biochemistry 54, 5839-5848. Bruun, S., Stöppler, D., Keidel, A., Kuhlmann, U., Luck, M., Diehl, A., Woodmansee, D., Trauner, D., Hegemann, P., Oschkinat, H., Hildebrandt, P., Stehfest, K. (2015) Dark-adapted states of channelrhodopsin and their photoreactions, Biochemistry 54, 5389-5400. Velazquez Escobar, F., von Stetten, D., Günther, M., Keidel, A., Michael, N., Yang, Y., Heyne, K., Lamparter, T., Essen, L. O., Hughes, J., Gärtner, W., Mroginski, M. A., Hildebrandt, P. (2015) Conformational heterogeneity of the Pfr chromophore in plant and cyanobacterial phytochromes, Front. Mol. Biosci. 2, 37. Luck, M., Bruun, S., Keidel, A., Hegemann, P., Hildebrandt, P. (2015) Photochemical chromophore isomerization in Histidine Kinase Rhodopsin HKR1, FEBS Lett. 589, 1067-1071. Velazquez Escobar, F., Piwowarski, P., Salewski, J., Michael, N., Fernandez Lopez, M., Rupp, A., Qureshi, B. M., Scheerer, P., Bartl, F., Frankenberg-Dinkel, N., Siebert, F., Mroginski, M. A., Hildebrandt, P. (2015) A protonation-coupled feedback mechanism controls the signaling process in bathy phytochromes, Nature Chem. 7, 423-430. M. A. Mroginski, TU Berlin; P. Scheerer, Charité Berlin; F. Bartl, P. Hegemann, HU Berlin; H. Oschkinat, FMP Berlin; W. Gärtner, MPI Mülheim; T. Lamparter, Univ. Karlsruhe; J. Hughes, Univ. Giessen; L. O. Essen, Univ. Marburg; J. Matysik, Univ. Leipzig; K. Forest, Univ. Wisconsin/Madison; H. Bonomi, UBA Buenos Aires.